In the article about Indian Cabinetmakers in Piedmont, NC, by Dr. Patricia Phillips Marshall, reported recently on Lisa Henderson’s Fourth Generation Inclusive blog, we learn several interesting things. First, Dr. Marshall shows a map with Greensville County, VA, which borders Northampton Co., NC, highlighted and states that the Day and Jeffreys (Jeffries) families moved to NC from Greensville County, VA. According to Dr. Marshall, Thomas Day was a free African American who, by 1850, had built North Carolina’s largest cabinetmaking shop in Milton, Caswell County, NC. You can see a photo of a statue of Thomas Day here. 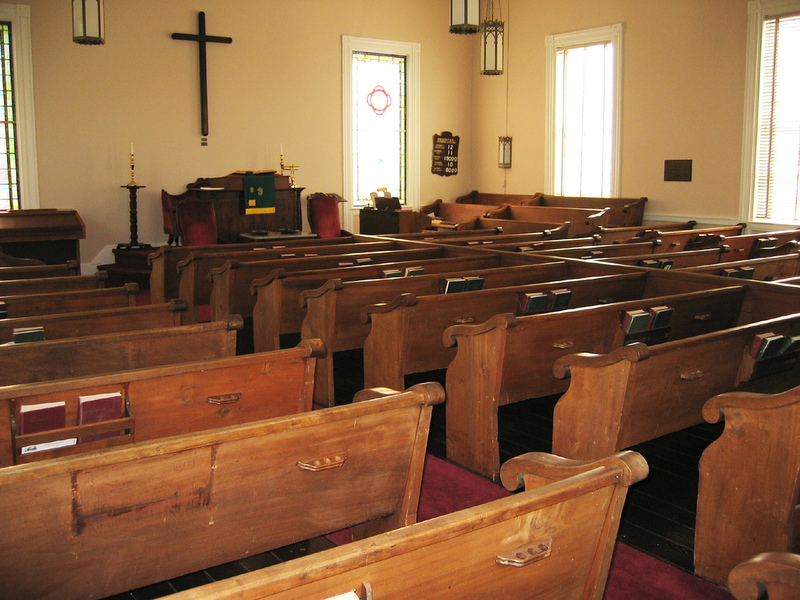 His church pews still grace the inside of the Milton Presbyterian Church where he and his wife, Acquilla were allowed to sit in the pews (shown above) among the white worshipers rather than in the slave gallery. Thomas was born in 1801 in Greensville County, Virginia, to mixed-race parents, John and Mourning (Stewart) Day, and moved with his family to Warren County, North Carolina, in 1817. When he moved to Hillsborough in the early 1820s, it appears that he became friends with members of the Jeffreys family who, although listed as “mulattos” in official records, were actually of Indian origin. The Jeffreys were part of a larger group of Occaneechi people from Virginia who had settled in the northwest section of Orange County, which became Alamance County in 1849. As with the Day family, the Jeffreys family had originated in Greensville County, Virginia. In 1830 Uriah Jeffreys served as a bondsman for Thomas Day when he married Aquilla Wilson. A bondsman was usually a close family member (such as a father, brother, or uncle) who assured the court that the couple should be married, and that the groom would not change his mind and leave the bride at the altar. Uriah Jeffreys must have been a close friend of Thomas to agree to be his bondsman. Historic records make it clear that both men were cabinetmakers, and it is possible that Uriah and his brother Nathan worked with Thomas Day for a short time. Uriah moved to Ohio with two of his brothers, Parker and Augustus. Unfortunately, they experienced the same type of prejudice in the North that they had tried to leave behind. The law required free blacks entering Ohio to pay a bond of $500 to county officials. Whites thought this would guarantee that only free blacks of “good character” would settle and be able to support themselves. Parker Jeffreys refused to pay, insisting that his blood was a mixture of Indian and white, and not black. The case went to the county court, where he lost. Jeffreys persevered, and the Ohio Supreme Court heard his case in 1842. In Parker Jeffreys v. Ankeny et al., the supreme court justices ruled that he was an Indian with no African ancestry and did not have to pay the bond. Members of the Jeffreys family continued to make furniture near Xenia, Ohio, well into the twentieth century. According to Forest Hazel, in the Parker Jeffreys vs Ankeny case, Jeffreys was proven to be the son of a white man and a “woman of the Indian race.” Parker’s brother also went to court about the same time to change his name and the court also noted his Indian ancestry. Ebenezer Lane, a Justice of the Ohio Supreme court wrote the majority opinion in the case in which Parker Jeffreys has been refused the right to vote based on an 1802 law limiting voting to white people only. Jeffrey’s mother was noted as half white and half Indian during the trial. There is no 1790 or 1800 Virginia census. However, in 1810, Greensville County shown no free people of color, at all, a situation which strongly suggests a problem with the census. There are no Jeffreys or Guy families listed, by that or any similar spelling. In the 1810 census for Orange County, NC, there are no “free colored” Day families listed, but by 1820 there were several. Join us in a future article where we’ll extract the Orange County, NC free families of color from the census records. This entry was posted in North Carolina, Ocaneechi, Ohio. Bookmark the permalink.